Location: Talybont-on-Usk is a village of some 350 inhabitants in the parish of Llandetty, Powys, six miles east of the town of Brecon in the heart of the Brecon Beacons National Park. It nestles on the south side of the valley of the River Usk where the Caerfanell valley joins it. Here the Usk valley suddenly narrows as the river cuts through the Brecon Beacons-Black Mountains escarpment on its way south to the Bristol Channel. Talybont village, looking south-west across the Usk valley from Allt yr Esgair, with the Caerfanell Valley beyond and the main Brecon Beacons ridge to the right. Celtic Origins: There are tantalising glimpses of an ancient past: twin Iron Age Forts look down on the village from Dan y wenallt and Allt yr esgair, and ancient trackways and Roman roads followed these ridges bounding both the Usk and Caerfanell valleys; an inscribed stone near the Usk ('Gilestone') is close to a probable Roman crossing point of that river, and Celtic 'Ogam stones' with their strange markings have been found in the area. Llandetty Parish Church is dedicated to St Tetti, a daughter of the powerful 6th century King Brychan who gave his name to "Brycheiniog" (Brecknock). Medieval Foundations: However, Talybont itself grew up in the later Middle Ages at the 'end of the bridge' over the Caerfanell which gave it its name. Here herders, travellers, and traders using the Caerfanell ridge routes from the Beacons and the valleys to the south joined the Usk valley road connecting the Norman strongholds and markets of Crickhowell and Brecon. This old road followed a discontinuous bench of stones and clay (a legacy of the Ice Age*) along the edge of the marshy flood plain of the Usk. The fast-flowing Caerfanell provided a clean water supply and a site for a water mill, and the fore-runner of the White Hart Inn grew up to cater for the needs of travellers, with a small chapel nearby. Talybont was then just one of a few scattered hamlets near the western end of the largely upland parish of Llandetty, whose tiny Parish Church lay nearly two miles to the east. Whilst most of the surrounding hills had a cool and rainy climate and very poor soils, the more sheltered Usk Valley was a productive and accessible farming region. It attracted, in turn, Neolithic and Bronze Age settlers and Iron Age farmers from the south and east, Irish missionaries from the west, and Roman legionaries, Norman barons, and medieval wool traders from continental Europe. Large prosperous farms and estates were laid out, such as Maes Mawr and Llandetty Hall, serving markets in both Wales and England. In Tudor and Stuart times the Usk valley became an increasingly important route to the ports in West Wales that gave the English Crown military and colonial access to Ireland. The valley road through Talybont became a turnpike (toll road), later superseded by Telford's Military Road on the opposite side of the Usk (the modern A40, but Talybont was not linked directly to it until the railway era). However, it was industrial change in the Coalfield south of the Beacons that produced most of the recognisable features of the village we see today. 19th Century Transformation: The construction of the Brecon and Monmouthshire Canal along the Usk Valley in 1804, and the Brynoer Tramroad that linked it with the booming collieries, quarries and iron towns along the 'Heads of the Valleys' to the south of the Beacons, caused Talybont to become an important local transport focus: they met close to the road bridge over the Caerfanell. Wharves were built on the canal side to store and distribute grain, timber and coal, while kilns alongside produced quicklime for fertiliser. The packhorse bridge over the 'Mon and Brec Canal' at the White Hart Inn, viewed from the Bryn Oer Tramroad. The road bridge across the River Caerfanell that gave Talybont its name is just off to the left, along with an aqueduct for the Canal. The railway bridges over the canal and road are in the trees to the right. To serve the growing number of residents, workers and travellers in the village in the 19th century, a market grew up, two non-conformist chapels were built and the Star Inn opened, followed later by the 'Travellers Rest'. A smithy by the White Hart repaired farm tools and equipment, and provided nails, tires and plates for the canal barges and Brynoer 'drams', and shoes for the horses drawing them. The choice of the Caerfanell Valley for the single track line of the Brecon and Merthyr Railway in 1863, and the consequent opening of Talybont-on-Usk station, the Usk Hotel opposite, and a new bridge giving access to Telford's road seemed to have successfully secured Talybont's future, but the success was short-lived. By the end of the 19th century farming was in decline (all over Britain, but marginal areas like the Brecon Beacons were particularly badly affected), and the boom period for trade across the Beacons was over as the iron industry began to decline in the face of overseas competition. The cumbersome pack horse, tramroad and canal system had long outlived its usefulness, and the railway line, with its steep gradients and limited potential for either passenger traffic or trade never lived up to expectations and hardly turned a profit. 20th Century Change: Talybont was still growing, and by the beginning of the 20th century was easily the largest village in the area, but its services had failed to keep pace with its population, and its Victorian economy and infrastructure did not fit it for the challenges that lay ahead. Benefactors in the Parish had provided money for almshouses in the village, and a primary school was built across the Canal, but Talybont had no established Church, Community facilities, or administrative functions. So it was that in 1911 a combined Mission Church and Community Hall was built 150 yards along the little lane that led up the Caerfanell Valley (aka Glyn Collwn, or "the Glyn") to Torpantau and Pontsticill. Initially serving just the village and neighbouring farms, it was soon caught up in a new wave of dramatic changes, this time in the Glyn, triggered by social problems and political decisions in Monmouthshire, 35 miles to the south. Newport, near the mouth of the River Usk, had grown very rapidly in the 19th century into the main coal and iron exporting port and industrial town serving the eastern half of the South Wales Coalfield, but had major drinking water supply problems. When concerns were increasingly being expressed about repeated water-borne disease in the town (including typhus and cholera), the Borough Corporation decided to investigate the upstream tributaries of the River Usk in the Beacons as a new source of clean water. The River Caerfanell seemed ideal: it drained the 2000 foot plus Beacons Ridge with its high rainfall and impermeable sandstone rocks, and flowed in a narrow trough-like valley which would provide large storage capacity, and was easy to dam. Moreover, there was relatively easy access via the Usk and Caerfanell valleys, and existing tramroad and railway links to quarries at the head of the neighbouring Crawnon Valley so that construction costs would be greatly reduced. Additionally, with high rainfall, steep slopes, poor soils and few resources, the population of the Glyn was limited to the little hamlet of Aber and a few, scattered, impoverished hill farms, so the water would be clean, with little danger of contamination. Opinion in the valley was divided, especially as the water was not for local use, but 35 miles away in Monmouthshire (which was an English county at that time!). Compensation was promised for farmers and landowners directly affected, and with certain environmental assurances being given and vague promises made of economic benefits to the area, the plans were drawn up and the scheme went ahead. There was surprisingly little organised opposition, but it is important to remember that the first two decades of the 20th century were a time of considerable local hardship and deprivation in the countryside, and there was the considerable distraction of wider political and social problems surrounding the Great War. Talybont Dam and Talybont Forest: Work started after World War One on the planned low-cost barrage one mile up valley from Aber, but this had to be abandoned because the water frequently disappeared into the river bed. This embarrassing outcome was a result of inadequate survey: the Project Surveyor had only visited the site once (after winter rain), had not recognised the highly permeable nature of the bouldery valley floor there (another legacy of the Ice Age)*, and hadn't even bothered to talk to local farmers! In spite of this fiasco the Corporation tried again half a mile further downstream. Six farms in Glyn Collwn were bought up and their buildings demolished in preparation for the construction of the new larger dam and reservoir, as well as its water treatment plant, and the twin gravity pipelines following the Caerfanell and Usk valleys to Newport. Associated with the water scheme was the planting of conifers on the surrounding slopes by the Forestry Commission, designed to reduce erosion of the steep slopes and the consequent silting of the reservoir. 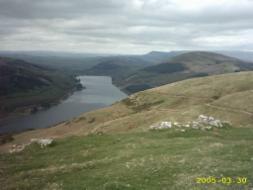 Talybont Reservoir and Talybont Forest were each the largest in South Wales up to that time. A temporary hutted village was built near Aber to house the influx of workers, and some on Church land opposite Talybont School. The inns of Talybont did a roaring trade, and even the Chapels and Mission Church benefited. But the construction work caused massive disruption to the landscape and village life, and the economic benefits in the longer term have been small compared with the social and environmental costs*. Tor y foel and the Glyn from near Talybont; View down the Glyn to Talybont from above the reservoir, the dam is to the right, below the conifers. which fills the whole valley bottom. By 1938 the work was finished, the reservoir was full, and the treatment works and pipelines were in operation. Many of the workers moved on, and the huts in the village were demolished to become the playing field for the school opposite. The long-suffering villagers might have hoped for a return to their pre-existing, largely pastoral way of life, but too much had already changed for that to be likely, and further political, social and economic change was already on the horizon. The decline of the traditional hill farming economy accelerated through the 20th century in the wake of the transformation of Glyn Collwn, the decline of heavy industry in the Coalfield to the south, and the socio-economic upheavals engendered by two World Wars. By mid-century the tramroad and Canal were virtually derelict, the water mill and lime kilns had ceased commercial operations, and traffic on the Brecon and Merthyr Railway was very limited. In 1963 the line was finally closed under Dr Beeching's infamous 'Axe'. Some of the line was sold off, including the station, which became a Gwent Outdoor Education Centre. Rural poverty and unemployment were spreading, and the local population was ageing as young people moved south and east to seek work. They were often replaced by newcomers (many of them English) taking advantage of cheap rural housing for retirement or second homes. A smal local authority housing estate was built at Pen pentre (with bungalows for the elderly) in order to try to address these problems; but demand always exceeded supply, particularly with the implementation of post-War building and planning regulations. Property prices went up inexorably, reinforcing the problems faced particularly by young families. The National Park: The 1947 Town and Country Planning Act was designed to address many of the acute housing and population problems of post-War England and Wales, mainly in the cities and towns, but it certainly had an impact on rural communties too. However, possibly the more significant planning statute from this time for Talybont was the National Parks Act of 1951, since this was designed not only to preserve the landscape of more dramatic and attractive areas of Britain and to restrict unsuitable development in them, but to develop a strategy for encouraging and managing their use for recreation. 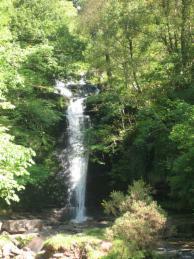 In 1960 the Brecon Beacons became one of the first National Parks, and this opened up new possiblities for Talybont. It was quickly recognised that Talybont had great potential for tourism, with its accessible location, distinctive landscape, and interesting transport heritage. The Monmouthshire and Brecon Canal was saved from extinction by the new British Waterways Board's decision to refurbish it for recreation: it was and still is the only Canal of its size (about 30 miles long) located entirely within a National Park. No boats are allowed on Talybont Reservoir, but its distinctive wildlife habitat, freshwater fish and waterfowl stock, and attraction for migrating birds caused it to be designated a Nature Reserve. The Forestry Commission opened up most of its extensive conifer plantations, and made car parks, picnic areas, and forest trails giving access to the surrounding hills, particularly at Blaen y glyn (the waterfalls at 'the head of the valley') leading to the popular Beacons Ridge Walk. At Blaen y glyn the River Caerfanell The col at Torpantau, where the road and railway leave the Glyn descends a series of steps in the valley. 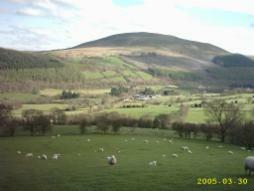 (on the left), taken from the access path to the Beacons Ridge Walk. From Talybont Dam up to Torpantau the former railway line became part of the Taff Trail long-distance footpath and cycle route through the Beacons, while the Bryn Oer Tramroad became a public bridleway from Talybont to the 'Heads of the Valleys' near Tredegar. The Park Authority opened a residential Study Centre by the dam at Dan y wenallt, and encouraged farmers and landowners to offer bed and breakfast accommodation. Other initiatives soon followed: boats could be hired on the Canal near the Travellers' Rest, and mountain bikes in the village; Talybont also became a magnet for Outdoor Pursuits specialists, who took advantage of the village's accessibility to a wide range of attractive nearby sites. Wilson's Grammar School in London acquired the old Church Hall in 1970, and converted it into a Field Study Centre, the Royal Navy established a training centre overlooking the Reservoir, and Nantllanerch near Aber became a Youth Hostel, then for a time a commune for Tibetan refugees. Welsh Water provided a serviced campsite near the Dam at Aber, and Gilestone Farm opened a Caravan and Camping Site in the Usk Valley. Buckland House across the Usk from Llandetty, and the former Reservoir Superintendant's house at Aber, became Conference Centres. Beyond the little col at the top of the Glyn, the old Brecon and Merthyr railway line was reopened as a narrow gauge steam railway from Pant Junction near Merthyr to Pontsticill Reservoir in the Taf fechan valley, with the hope of someday extending it to Torpantau, and possibly even to Talybont. The Canal Towpath looking towards the Star Inn, the start of the new 'Henry Vaughan Footpath'. The 21st Century: Recently, new signed trails have been opened along the Tramroad, the Canal, and the River Caerfanell (the 'Henry Vaughan Footpath'), and now Talybont Dam has become the site of a ground-breaking energy initiative: the Talybont Hydro water turbine. That produces electricity for the local community from the 'compensation water' that by law is required to maintain flow in the Afon Caerfanell at all times. Any surplus energy is fed into the National Grid, so at last the Talybont community can see a direct economic benefit from their Dam! Currently, an electric car hire scheme is in operation. Talybont may have lost a few of its recent functions, such as its mission church and hall, its chapels, two outdoor centres, and the Aber campsite, but it has kept its bus service, and a thriving shop and Post Office, and it has a refurbished Hall with a new children's playground and well-used recycling facilities. Its four inns are still popular, and the shop, the towpath and the main street are busy most days in the year (see photo above). The success of these services, along with the variety of local events and initiatives such as those listed on their excellent Community Website, all testify to a thriving and forward-looking community, well-equipped to meet whatever challenges the future may hold.